SARAH ELIZA: Recent Purchases: Elf etc. It's coming up to exams and I don't think I'll have a chance to spend my pennies during that time so I thought I would make my last few purchases before I become house bound to revision and here's what I bought! Elf Baked Blush "Peachy Cheeky" £3.95: I made my first order to elf and I'm fairly impressed with the things I bought starting with this blush which, being more of highlighter, isn't something I would normally go for but I thought I'd give it a go as I have nothing like this and I thought it would be great for spring/summer. Elf Blush "Candid Coral" £3.95: I've been trying to broaden my colour choices as well as my blush collection which consists of a bout 3 at the moment so I opted for this coral/orange which looked matte on the website but when it arrived it seemed to have gold running through it. When I swatched it, it was quite chalky so I'm not too sure if this will become a regularly used blush yet but we'll see! Elf Tone Correction Powder "Cool" £3.95: I've been looking for a new powder recently as I'm getting bored of the same old Stay Matte powder and when I saw this, it stood out to me as it's not something I'd seen before and so I thought I'd give it ago. I've already used it and I'm not 100% sold as of yet but we'll see! Elf Stipple Brush £3.95: This has been a most wanted product for ages now and I've finally got it! I didn't want to splash out on the Real Techniques Stippling brush when I'd heard good things on this one which is a fraction of the price. I've been wanting to get into cream blushes for a while now and I didn't want to go out and buy some if I hadn't got the right brush to use for it. Now I have, I'm looking for some good cream blushes so let me know of any good ones you know of! Elf Smudge Brush £1.95: I actually forgot I'd ordered this and thought I'd ordered different brush but I wasn't too bothered. I wish I'd read the description of this brush in more detail as I thought it would be more like a pencil brush but it hasn't got any hairs on it- I can't really describe what it's made out of but I'll give this ago and see how it is! Asos Over sized Smock Top £12: I'm a massive fan of smock tops and when I saw this pastel purple one for only £12, I had to pick it up. I've already worn it out and it's lovely and I know it's going to be a piece I wear a lot this spring and summer as it's nice and loose so it won't make me too hot. The Neighborhood "I Love You" Album £6.99: I've had an Amazon voucher since Christmas and I thought it was time I spent it on something I've been wanting for a while. I've been a fan of The Neighborhood for ages and I can't believe it's taken me this long to buy the album; I'm already listening to it non-stop and I know it's going to be a favourite for a while! Mac "Wood Winked" Eye shadow £10: This has been something I've been after for a while and thought it would be a great eye option for prom so I bit the bullet and ordered it off the Debenhams website. I bought the pan instead of the packaged one as it was cheaper and I thought if I was to buy more mac eye shadows in the future I could buy a palette and just put them in instead of messing around with depotting them. I've not used this enough yet to give a full opinion but look out for this in a future Prom Prep post! So that's it! Let me know if you're interested in me doing a full review of any of the products mentioned! 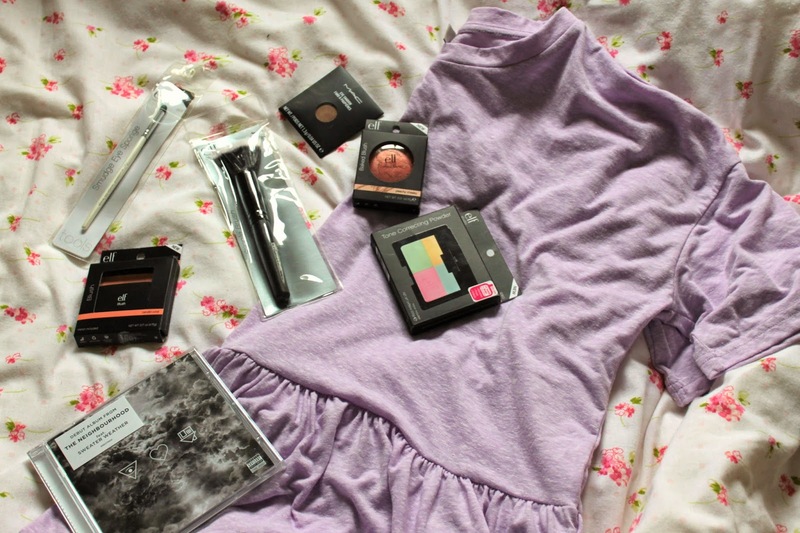 Lovely haul x Best of luck for the exams! The colour correcting powder looks interesting and I would love to read a review on that!